Kataragama, Kacharagama or Kadiragama... whatever name you may call it, it's a place of worship for all. People from all religions gather here to pray to the Kataragama Deiyo or God Skanda in the belief that their wishes would be granted. 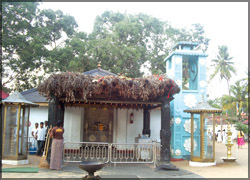 Kataragama has a great history linked with many myths and beliefs. So, we spoke to the Chief Priest of Kataragama Abhinavarama Temple, Saranathissa Thera, to learn about the history of Kataragama. There are a large number of stories which are believed by people as the true history of Kataragama, but these are mainly legends. 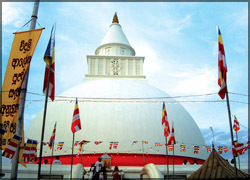 According to Saranathissa Thera, Kataragama has a history dating back to the time of the Buddha's third visit to Sri Lanka, in the sixth century BC, during the reign of the Provincial King Mahasen. The Buddha is said to have visited Kataragama with 500 other Arahat Theras. The present Kiri Vehera is said to have been built at the spot where the Buddha had sat. The location had been Mahasen's garden of Kihir trees. The Buddha had given the King a hair relic and the King had built a chetiya at the place, enshrining the relic. Since the chetiya was built in a forest of Kihir trees, it was known as Kihir Vehera. Later, for easy pronunciation, it had been changed to Kiri Vehera. The chetiya built by the Provincial King Mahasen had not been that big; it had later been renovated and expanded to its present size by several other kings including Dutugemunu. 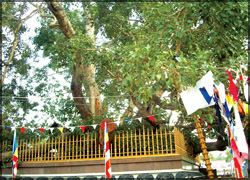 It is believed that King Dutugemunu made a vow at the bo tree, to renovate the place and build a devala, before he left to fight the war with Elara.